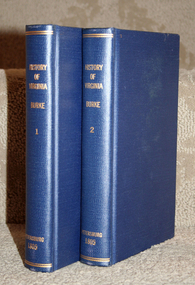 Volumes 1 and 2 (of 4), printed for the author by Dickson & Pescud, Petersburg, Virginia, 1804 and 1805. Re-bound in blue cloth. Minor toning and foxing. A rare early history of Virginia through 1710. 5 Vols. 12mo. Bound in Half green morocco, spines extra gilt, two red morocco labels each spine, with marbled boards, endpapers and edges. Published: London; George Bell, 1878. Provenance: From the Library of Howard K. Smith.